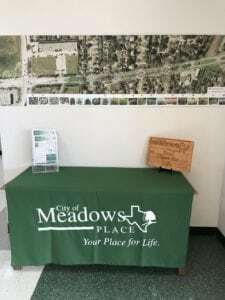 With the project design complete, Meadows Place City Council held the a series of 3 live meetings to allow the public to hear what is being planned, to ask questions and see firsthand what the project is going to look like. The first live meeting took place in the new Meadows Place Training Center. The second Live Meeting took place Wednesday, June 20th, at 6:00 p.m. at City Hall. There was a large scale drawing to look at and people on hand to take and answer questions. This drawing is now on display at City Hall for you to view along with additional information. The final public meeting will be held Tuesday, June 26th, at 6:00 p.m. just prior to the regular Council meeting. All who have questions are encouraged to attend. Kirkwood Project Moving Forward – after 11 years! In a unanimous vote, your City Council approved the Mayor and City Secretary to go out for bid on the Kirkwood construction project, which was a part of the 2007 Fort Bend Mobility Bond Project. This is for bid purposes only, not authorization to begin or pay for the construction. That will be dealt with later. We received the final construction drawings late last month from HDR Engineering and should have the bid documents ready to go by late June. The bids are expected back three weeks after that and then be reviewed to confirm the bids are complete and accurate. This will give us actual construction figures to work from so we can begin a financial evaluation and review of the project. Council will examine the results and decide the next steps to take. We will keep you posted as we progress.